This is the entrance to the Reception in the Los Amigos Beach Club in the Playa Marina Urbanisation. The access to the underpass to the Playa Marina beach is at the end of the car park on the right. When you walk back from the Playa Marina bus stop along the A7 /N340 road, you’ll step off the concrete verge and come into the picture from the bottom right. Mike to Shaz: Hi Shaz, thanks very much for writing in to Gomarbella. That’s a great time of the day to arrive at Malaga airport and you have lots of time to get to Los Amigos Beach Club without hurry or worry.Take the train from Malaga airport train station to Fuengirola, it’s a 43 minute journey and there are three trains every hour so don’t rush when you have collected your suitcases, just stroll to the train station in front of Arrivals and get your tickets from the ticket office or one of the ticket machines just before the barriers. 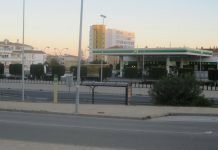 Only one block away from Fuengirola train station, walking towards the sea, is the Fuengirola bus station. Again no hurry, there are two buses every hour and you’ll be catching the M220 bus to Marbella. 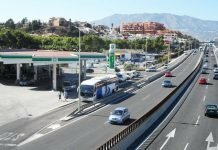 Here is a list of all the bus stops between Fuengirola and Marbella. The bus stop closest to Los Amigos Beach Club is the Playa Marina bus stop. Just after you have gone past the El Faro de Calaburra lighthouse on top of the hill next to the road on your right, start looking out for the Playa Marina bus stop. The bus fare in 2012 is €1.40. On the left you’ll see the Playa Marina bus stop. 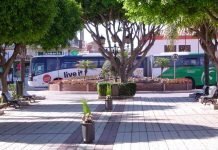 This is where you’ll get off the bus coming from Fuengirola bus station towards Marbella. Walk back along the road, inside the crash barrier for 500meters until the bend in the road. Look to your left and you’ll see the Los Amigos Beach Club Reception and the lovely green lawns. Here’s a view of Playa Marina and the bus stop on the sea side of the road. 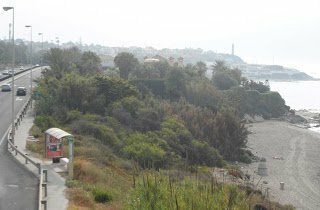 Use this bus stop to travel back towards Fuengirola. In the distance you’ll see the Faro de Calaburra lighthouse. On the other side of the lighthouse is Club La Costa World. 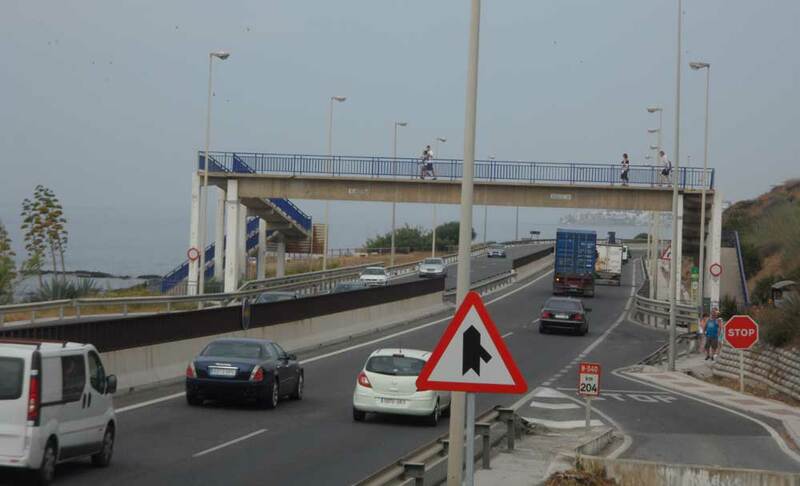 Use this footbridge next to the Playa Marina bus stop to cross the road. 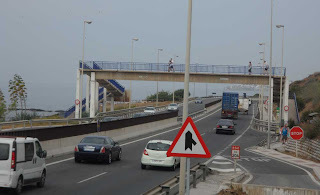 You’ll see people walking over the bridge to the beach. The other access to the Playa Marina Beach for visitors to Los Amigos Beach Club is from the Reception, see the top photo. Traffic on the right is travelling towards Marbella. 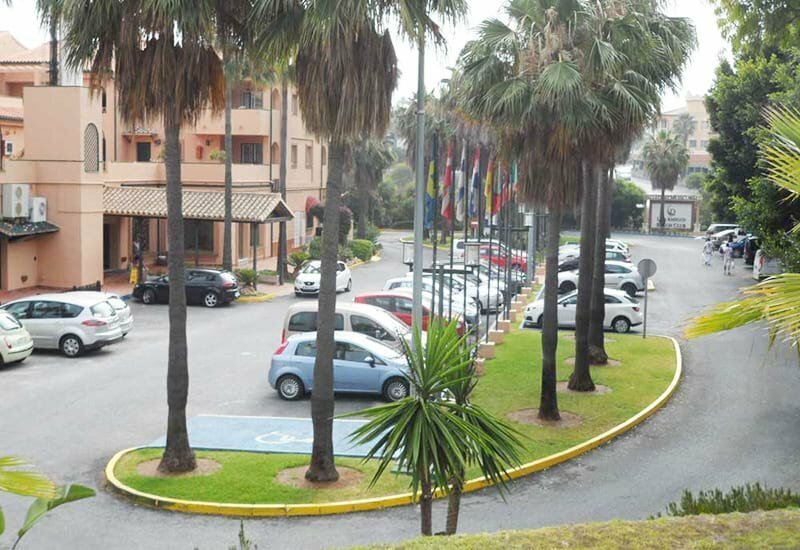 Walk back along this verge against the traffic flow to get to Los Amigos Beach Club Reception. Hi Mike! I am travelling to Fuengirola with a friend next week. 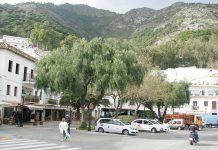 We would love to visit the shopping centre "La Cañada" in Marbella. Which is the best way to get there? Do you know how much it could cost getting there by bus and what bus line we would need? Hello Paul, I can't thank you enough for pointing that out. Somehow updating the page yesterday I reversed the headings. The left hand column is now Malaga Airport to Marbella and the right hand column is Marbella to Malaga Airport. The times have been treble checked. From the airport the bus you are looking at leaves at 12.30. Sincered apologies and another million thanks for letting me know. Its not at all easy trying to contact Mike of GO MARBELLA as I could not find any email address to send comment to. The instructions are quite weird. However Mike if you recieve this then could I mention that your updated version of the timetable from Malaga airport to Marbella bus station states that there is a bus at 12.15 and the version on the bus companies website Avanza states 12.30. Can you tell who is right?